There’s not shortage of great bars in our fair county, but when it comes to drinking in the winter, there’s a specific vibe needed. All these bars have it. Cozy. Not that crowded. Brown liquor and, in some cases, a fireplace. Go now while it's still cold. Dynaco: It opened a few years ago but it feels like it’s been there forever. That’s intentional. The fireplace in the back is the main draw but the cocktails and totally relaxed vibe work wonders as well. Brooklyn Inn - This place was made for winter nights. The pool table helps fight off cabin fever and on a winter evening the seats by the window are pretty ideal for watching the snow fall. Henry Public Go for the scratchy old-timey music on Sundays, stay for the stouts and burgers. Achilles Heel: Deep Greenpoint and well-worth the trip. Fireplace and excellent cocktails. Hot Bird - Often thought of a summer bar for their big pation, Hot Bird makes for a great winter spot too. Sometimes they have fires going outside but it doesn’t really matter if not. 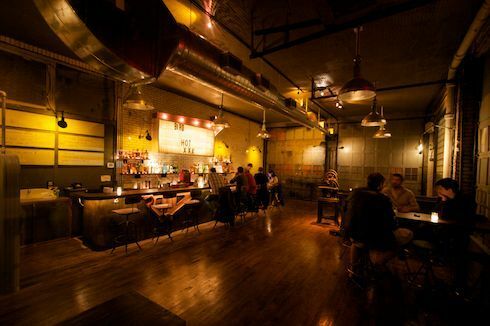 The old mechanics garage-turned bar begs you to order a whiskey neat and a beer and settle in. Gear Friday, FeatureJohn Peabody January 30, 2015 Gear Fridays, Faribault, Stanley, Taylor Stitch, Cocktails!